Several months ago there was a lot of news about the dangerous and life-threatening behavior displayed by primates; especially those that live in a human environment. This is a story about two chimpanzees who became best friends after they were rescued and allowed to live in a protected, but natural habitat with the help experts who understand them. Chouki lives at the Sanaga-Yong Chimpanzee Rescue Center in the rainforest of Cameroon. The seventeen-year-old chimpanzee is blind. A few months ago his right eye became painful and it had to be removed. He was nursed back to health by his devoted friend, another male chimpanzee named Kiki Jackson. Chouki was orphaned as an infant and taken in as a family pet, but when he turned seven his owners “donated” him to a facility that housed other great apes. Because Chouki was raised by humans, he didn’t know how to behave around the other chimpanzees and was hurt by the aggressive male leader of the group. It left him almost totally blind. That’s when he was rescued by the animal welfare organization called, IDA-Africa which is supported by In Defense of Animals. He was sent to live at their chimpanzee rescue center. 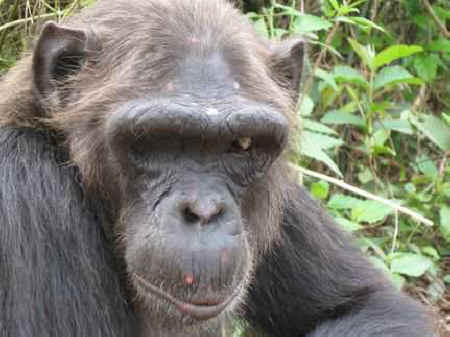 Soon after Chouki arrived at the sanctuary he was adopted by a group of seven apes. Kiki Jackson is their leader. He’s a gentle, older male who quickly bonded with the disabled chimpanzee. He welcomed Chouki and taught the juveniles in the group to be gentle with him. He has been a devoted friend to Chouki ever since and the two are inseparable. The group lives together in an enclosed complex that spans over several acres of forest. The IDA-Africa workers adapted nearly one-acre of the area especially for Chouki so could get around. They outfitted trees with ropes and put in special trails. Kiki often looks after Chouki in this safe area while the rest of the group explores more of the forest. Dr. Sheri Speede, founder of IDA-Africa first ran into Kiki Jackson in 1999. He and a female chimpanzee lived in a small concrete cell at a hotel in a coastal town in Cameroon. The two companions were there as entertainment for the hotel guests. Dr. Speede didn’t like the living conditions of the friends, but because they were being fed regularly and appeared to be in relatively good health she chose to rescue two other chimpanzees that needed more help. Later in the year, Dr. Speede sent a volunteer to check up on Kiki and his friend. They were horrified at their discovery. The person who had been paid to feed the apes had left his job and the hotel hadn’t hired anyone to replace him. Kiki was barely alive when they found him and his friend had starved to death. IDA-Africa took custody of Kiki and rushed him to the sanctuary for treatment. Seven months later, he had gained 40 pounds and was ready to join the 62 other chimpanzees at the rescue center. After Chouki’s surgery in February to remove his eye, Kiki stayed right by his buddy's side for first few days. He was very gentle as he inspected his friend and taught the other chimpanzees in the group to be careful too. With the help of Kiki's companionship Chouki soon began to feel much better. His appetite came back and he started to play again. Dr. Speede says that Chouki’s other eye may also need surgery in the future. But everyone is confident Chouki will be in good hands with the help of his best buddy and devoted friend, Kiki Jackson. The Sanaga-Yong Chimpanzee Rescue Center began after U.S. veterinarian Sheri Speede DVM visited a hotel in Cameroon. At the hotel she saw three chimpanzees being held captive as entertainment. She was also aware of the huge problem of poaching of the great apes and the bushmeat trade that left many infant chimpanzees orphans. She knew she had to do something to help. And with support from In Defense of Animals she put together a modest sanctuary. Today the rescue center rests on 220 acres and is home to more than 60 rescued chimpanzees.